The Clover Convertible Bag project is dragging on…. it’s so apparent, even my husband commented how long it was taking me to finish this thing. Currently, I have the lining (along with another zippered pocket and a slip pocket) completely finished. 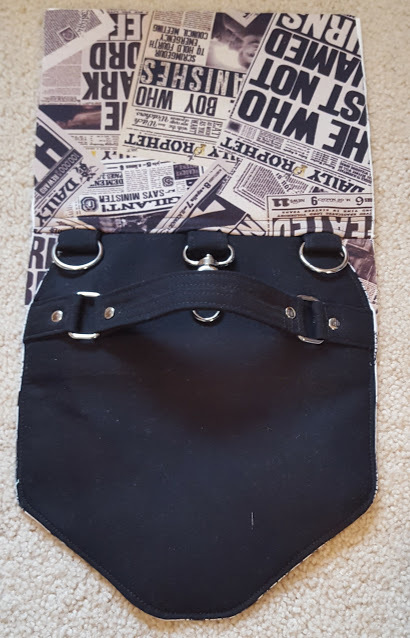 Even though I was on a roll with this segment of the purse, I had to take a brief break because my zipper was never going to work (it was the closest that I could find at my local store) and wound up having to order one. In short, I had originally ordered a parka zipper (which has a zipper on either end), but really did need the double purse zipper (the two zips meet in the middle and zip towards the ends) that was listed in the materials. I figured using the purse zipper would not only make it look nicer, it would be conveniently located when I actually have to get into the train case portion of the purse. 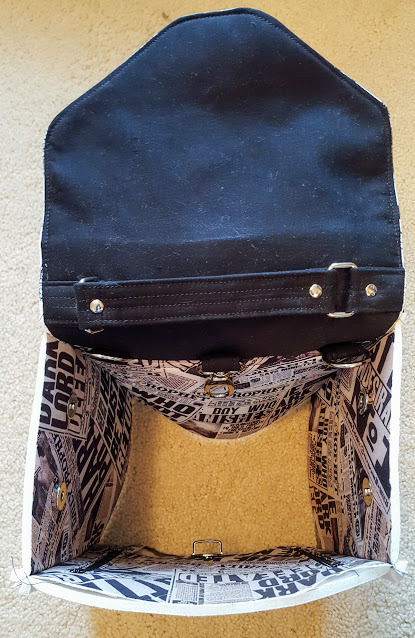 Once my purse zipper arrived a few days later, I began construction of the train case portion of the instructions. I got as far as inserting the zipper and just stopped…. There is such a tremendous amount of bulk I just struggled (and my machine too) to sew through it all. The worst part is, I’m not even done and I know it’s just going to be worse. Tomorrow I have vowed that I am finishing this bag, which means that it will at least be completed in the same month as what I started in. This entry was posted in Uncategorized on January 31, 2017 by stacy. There is something gratifying about being able to finish a project in one sitting, but finding the time to sew can be a struggle. Longtime designer and blogger, Kate Blocher from See Kate Sews fame, has come up with a collection of tutorials that can be made in an hour. Best of all, they’re beginner friendly as well so just about anyone can make them. See Kate Sew: 24 Learn-to-Sew Projects You Can Make in an Hour has a little bit of something for everyone: bags and accessories that include instructions for totes, key fobs, and dopp\cosmetic bags; pillows, organizers, and placemats for those that love home decor; dolls, marker rolls, and pretend food for the younger set (although I really want to make a few felt donuts to use as pincushions), and a fun apron, bracelet, and adorable tee for when you what to whip up something for yourself. 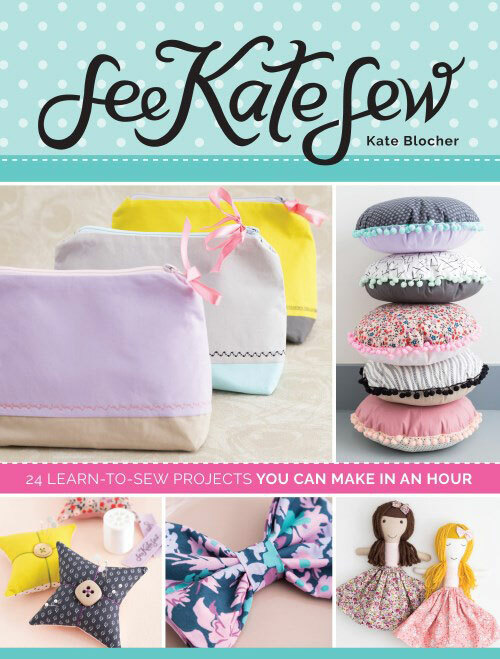 The instructions are easy to follow and there’s plenty of illustrations that guide you through the steps – so this is book perfect for the beginner looking to expand their skill set (plus there is a handy Sewing Basics section that includes tips, terms, and tools). As far as patterns go, there are a few projects that require you to measure the pieces yourself, but a majority of the designs have full size pattern pieces (yay, no enlarging on a photocopier) that are located in the back of the book. But the best part? There’s not a lot of crazy notions or tools needed to complete most of these projects – chances are you have everything you need on-hand to dive right in and get started! This entry was posted in Uncategorized on January 27, 2017 by stacy. Everyone needs an awesome hoodie pattern. Best of all, this one is free. Sew a pretty pair of knickers in time for Valentine’s’ Day. Have a Tsum Tsum lover in your house? Whip them up an adorable Eeyore plush. Stay warm. Look Fashionable. Learn how to sew up this easy fleece poncho. Not only does this pretty pillow help you decorate for Valentine’s Day, but it’s a great scrap buster project, too. This hanging pocket organizer is great for storing patterns and magazines or keeping your mail sorted in the house. This is no ordinary fur muff, it doubles as a purse too. There’s a saying that goes “Always be yourself, unless you can be a unicorn.” Now you can be a unicorn with this DIY Unicorn Hoodie tutorial. Stay warm and celebrate Valentine’s Day with this fun fleece hat. Need an adorable baby gift? This bandana drool bib can me made two different ways or try this easy pullover version for toddlers. This week, Sew4Home has a great monogrammed travel trio pattern collection which includes a large tote, device case, and zippered pouch. Great for traveling or just touch-up on the go, Anke’s Make-up bag features a zippered pouch and attach brush roll. Organize you sewing room with this handy little fold-up baskets that are made with just two fat quarters! Looking for something a little less conventional? Try this round version instead. Have a cold? Take your tissues with you in a cute tissue holder case. This entry was posted in Uncategorized on January 26, 2017 by stacy. 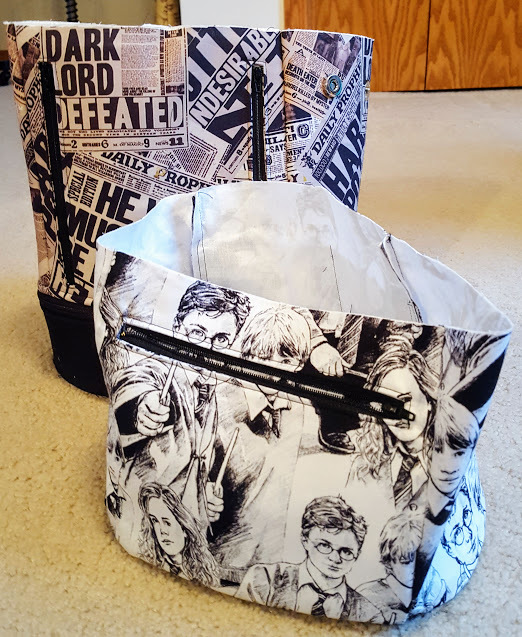 I realize taking a good photo of a bag in progress is next to impossible, but I had to share that (a majority – I still need to make the train case) of my bag is complete! What you can’t see in the photo (why did I keep it wrong side out?) is that the bag has 2 front exterior (welted) pockets, the front lock closure, and snaps on both of the bag sides (to bring in the edges if desired). The front pockets are constructed in a way that is unique to what I’ve ever sewn before, but turned out very nicely…. and best of all, when you unzip it, it looks like Harry and his friends are peeking out. I’d like to say that the hardest part is behind me, but I still have the zippered train case (that is attached to the bottom of the bag) to make, but first, onto the lining! This entry was posted in Uncategorized on January 25, 2017 by stacy. If left to his own devices, Easton will play on the computer all day. So, on the weekends, I wind up making him take a break from it and find something else to do. This weekend, Easton literally laid on the floor complaining he had nothing to do. After giving him a ton of options, he finally took me up on my offer to make Valentine’s Day cards on the Cricut. We stated out with a simple card that has a cute image that you can color yourself (it also has punches that you can insert crayons) and morphed into making a shirt. 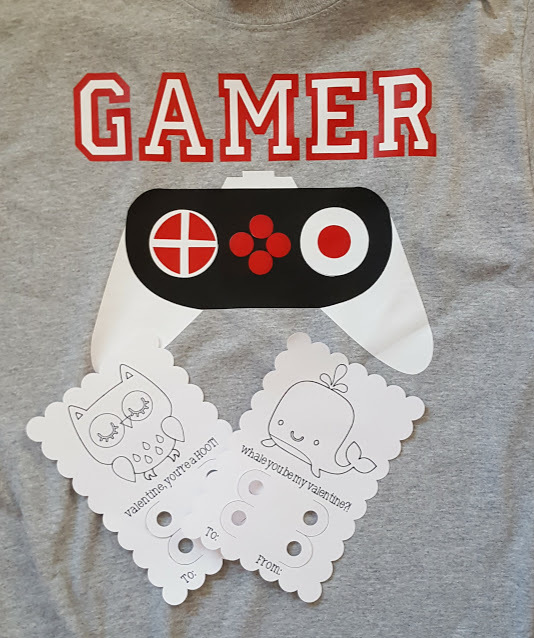 He stumbled across this project on the Cricut Design Space and decided it was the perfect project for him. It’s really made for appliques on a jacket back, but we made it work for iron ons and a t-shirt. Aside from the ironing, he did almost all the work himself and really enjoyed it – his exact words was “My mind is blown (that this machine can do this)”. The only unfortunate thing is that the “buttons” on the controller came out overly large and with the wrong spacing, so I wound up having to do that part by hand…. and I think it looks a bit sloppy. Otherwise, Easton is extraordinarily proud of the shirt he made himself. In fact, he’s wore it to school yesterday! This entry was posted in Uncategorized on January 24, 2017 by stacy. The one thing about bag making is that you can toil away for hours and not look like you’ve made much progress. When I make something that I know is going to take awhile to work on, I try sew it in chunks and leave off at what feels like a ‘natural stopping point’ (so I don’t have to go back and figure out what I left off and what needs to come next, etc.). Consequently, this is where I left off with my Clover – the flap. Oh, the flap. I won’t say it’s a hot mess, but I can honestly say that this is not my best work. I am patting myself on the back that I made an awesome looking handle…. I even added rivets which look incredibly professional, but the bulk that I contended with really messed with how the flap turned out over all. You see, I decided last minute to skip the piping – with a change in fabrics I didn’t really see that it added anything to the bag. 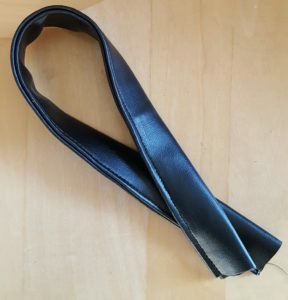 In hindsight, I think I needed to use the piping to ‘hide’ the lining that keeps wanting to peek out around the strap edges (because of the bulk in this area, you just can’t push that lining back where it belongs, even if you trim down the seam allowance). So, I went with it. Yes, you read that right, I just rolled out the lining a smidge along the entire edge and stitched it in place that way…. sort of like a weird faux piping. Other issues I had with this flap? Well, I discovered Peltex melts. There is a section that you create a stiff ‘handle rest’ (for lack of a better term) that is made by sandwiching popsicle sticks in between Peltex. Since my peltex is iron on I decided to fuse these sections together…. and melted a portion of it. This technique does create a very stiff area that the handle is placed on (it appears that it is the area that will be on the top of the bag and folded over to the front to latch), but the rest of the flap seems floppy in comparison – like it needs more interfacing. To say that this bag is ‘challenging’ is probably an understatement. After looking through photos and comments others have made about this pattern, I see that I’m not the only one saying that, either. At this point, I’ve invested enough money into this sucker, I’m going to finish it come hell or high water, but I’m pretty sure the end result isn’t going to be pretty. Good thing this bag is just for me. This entry was posted in Uncategorized on January 23, 2017 by stacy. Some fabrics are just jerks (alright, that is not the word I was using the other day, but you get the idea). You see, I started the Clover Convertible Bag the other day and spent the first segment of it swearing like a sailor. Fortunately, the bag starts off by making D-ring and clasp slides – a part that I originally had designated to be made in my vinyl so I discovered what a total piece of crap this material was (to make a long story short, it sews horribly, wonder clips leave pressure marks, and was difficult to ‘crease’ so that it could be sewn into a ‘strap’ -). 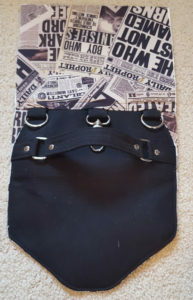 After fiddling with this fabric for ages (it appears fine in the photo, but the stitching is horrible and the strap is ‘twisted’ out of position so it doesn’t lay quite flat), I decided that I didn’t want to spend my entire time making this bag and struggling with the vinyl and decided to scrap it. So, back to the drawing board. I searched my stash and decided on a distressed black denim. I re-cut out everything and then decided that didn’t look good with the Harry Potter newsprint. So yet again, I searched my stash (because at this point I’ve spent so much money in this bag, I’m not investing more). They say the “third time is a charm” and so I have FINALLY selected a black twillish material – it is not exactly what I wanted, but I think it will do. All the interfacings have be cut again and re-applied so I think I am ready to start this adventure all over again. Let’s just hope that the initial fabric fiasco isn’t a sign of a doomed project. Note to self, if you find a vinyl that you like, stick with it and use it for all you projects. This perfection leather has been my favorite so far (it sews beautifully, wonder clips don’t leave pressure marks… even thin pins can be carefully used, and best of all you can use a touch of heat with a press cloth and it doesn’t damage the material) and I am kicking myself for not breaking down and buying more for this one. This entry was posted in Uncategorized on January 20, 2017 by stacy. Who needs boring red boxes of chocolates this Valentine’s Day? Instead, make a beautiful quilted cover that can double as a mug rug when you’re done! The big trend in knitting has been the ‘messy bun hats’ that allow you to still wear your hair up while you keep the rest of your head warm. Now you don’t have to know how to knit to make one, you can sew one up instead! Learn how to make your own clothing labels with the alphabet on your machine and a bit of bias tape. Win a pincushion kit and some interesting fillers to stuff it with! Stay cozy and look luxurious with this fabulous faux fur pom scarf. Have a makeup addict in your house? Be sure to make them this fun Zippy Lip Pouch that’s perfect for stashing make-up on the go. We tend to eat lunches away from the table around here, which makes eating hot bowls of soup, etc. difficult. These soup bowl cozies are the ideal way to eat without burning your hands. Not only does this maxi dress remind me of something you’d see being sold by LuLaRoe, but it’s also made from the super soft brushed poly just like them! Stashed a lot of fabric and don’t know what to do with it? How about using it to make an accent wall? If one of your new year’s resolutions was to decrease the clutter in your life, then you’ll definitely want to check out this purse organizer or stash your belongings in this classic zipper pouch. Never bring a boring dish to a potluck ever again. Tote your container in a zippered casserole carrier instead. I love the idea of t-shirt quilts, but have never taken the plunge in making one. This T-shirt Quilt for Dummies tutorial might help push me to start! Struggle to find the perfect button? Learn how to make your own! I’m pretty sure that this Lego Bucket could not contain the massive quantity of Legos we have in this house, but it’s a great way to store and take them on the go to friend’s houses. This entry was posted in Uncategorized on January 19, 2017 by stacy. When Peek-a-boo Pattern’s Pemberley Pullover was originally released, I immediately snagged it up thinking that I would make fun cowl neck, athletic tops that would match some of the crazy leggings I had been making. Unfortunately, I realized that I never got enough fabric to do this, so the pattern just sat in my computer for ages. For whatever reason, I decided to give it a go yesterday and, after a very long search through my fabric stash (it probably took me as long to find the material that what it did to tape this pattern together), I decided that I would finally use the stripe sweatshirt knit that I had picked up from Gorgeous Fabrics last year. 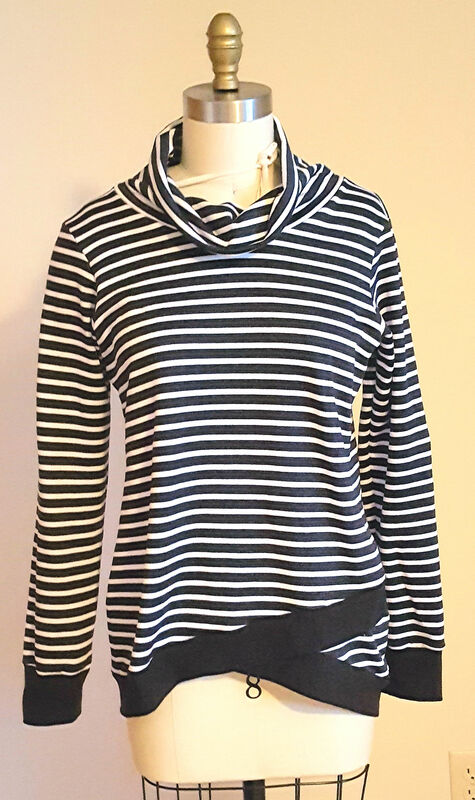 The Pemberley is a mock crossover design top with a slightly raised hem in the front and an optional cowl neck – which is vastly different than other patterns I currently own. Overall, this one sewed up pretty quickly… except I really struggled with the mock crossover piece. I’m not sure if it was because I was tired and couldn’t figure out the instructions or if it was just the instructions themselves, but I did ‘wing’ this area. It worked out fine, but the bottom layer did not get stitched down entirely to the upper band as described. I also skipped the drawstring in the cowl because I didn’t have small enough cording to pull through the eyelets\grommets I had on hand. 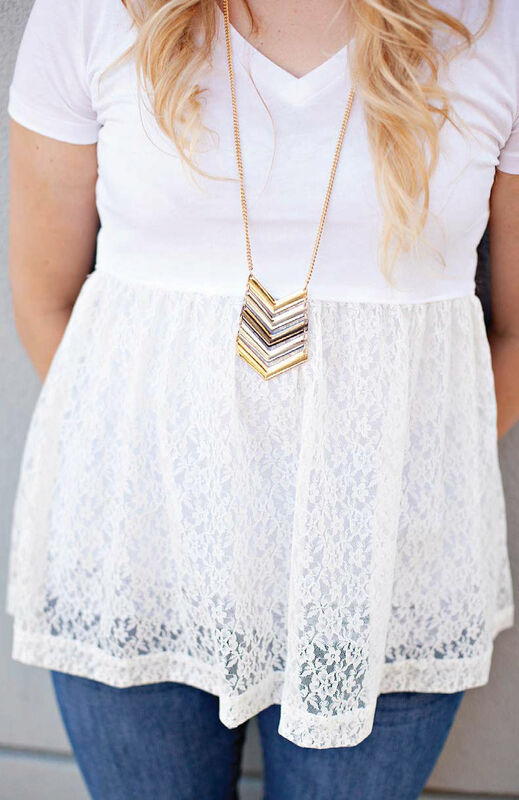 According to the instructions, the pattern is slightly oversized because it is designed to be worn in layers. If you’re wanting to wear this as a shirt, you should go down 1 size (or 2 for something more fitted and in thinner material). Consequently, I decided to go down one size – and I’m glad I did, because I like the way this fits on me. The material on this one makes the finished shirt cozy, but still has a fabulous drape (especially for a sweatshirt knit) so I don’t feel like I’m wearing a sack. So would I make this one again? I think so. I noticed this morning that Peek-a-boo Patterns announced a sew along for this top starting next week – I may attempt to find some athletic style fabric and give it another go, this time paying more attention to how I insert the mock crossover piece. If you’re interested in joining this one too, she’s running a sale on the Pemberley Pullover and the girl’s version, the Piccadilly Pullover (she didn’t mention how long the sale lasts, though). This entry was posted in Uncategorized on January 18, 2017 by stacy. This weekend, the weathermen predicted a devastating ice storm would whip through our area. Consequently, my big plans changed dramatically (we had postponements and cancelations well ahead of the storm’s arrival). You would think that would lead to more productivity in the sewing room, but I was fairly bummed out and found myself sitting on the couch, sulking, instead. I did, however, manage to cut out all the pieces to the Clover Convertible Bag I mentioned last week. While it doesn’t look like much in the photo, there are a lot of piles of fabric and interfacing under those pattern pieces. Fortunately, there is a handy chart in the back of the instructions that helps keep you on track. Now that that’s finished, I need to focus in on fusing all that interfacing and get this project started….. maybe in a couple of days, I’m still pouting about my change of plans. By the way, the weatherman got it completely wrong here – we wound up having a slight glaze of ice initially and then it rained the entire weekend. This entry was posted in Uncategorized on January 17, 2017 by stacy.